On April 6, the City’s Board of Zoning Adjustments approved a plan to redevelop the former Georgia Pacific Gypsum plant at 2000 Marina Blvd. into a new Class A industrial building. The $45 million redevelopment of the 13 acre site will include 297,000 square feet of industrial space and 15,000 square feet of office space, as well as outdoor patios with roll up doors, loading docks, and parking. The project will also bring significant public improvements to almost 1,000 feet of Marina Boulevard, including street widening, undergrounding of utilities, and installation of extensive landscaping. The building design will feature a number of architectural elements, recognizing its importance as a new development along the gateway to the San Leandro Marina. In keeping with the goals of the City’s Next Generation Workplace District Study, the project has been designed to provide a highly flexible space that can cater to various industries, providing the amenities and utilities required for advanced manufacturing, research and development, as well as traditional manufacturing and food production. At the April 6 meeting, developer Timur Tecimer of Overton Moore Properties expressed that one of the project’s main goals is to create a quality work environment where top businesses can attract and retain employees. 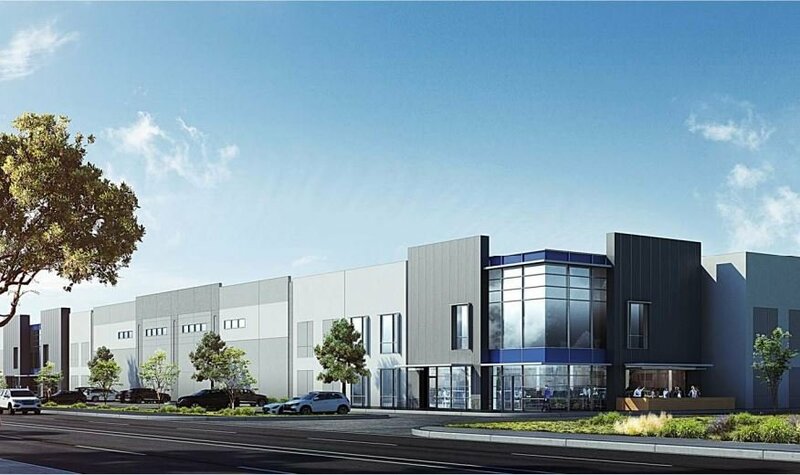 This project is one of several new industrial developments that will be constructed in the coming years, serving as a testament to San Leandro’s strong industrial market, with a great location, robust business base, strong utilities, and a business friendly atmosphere. Learn more about this development and other industrial developments in San Leandro in this recent East Bay Times article, as well as San Leandro Next’s 2017 development preview.